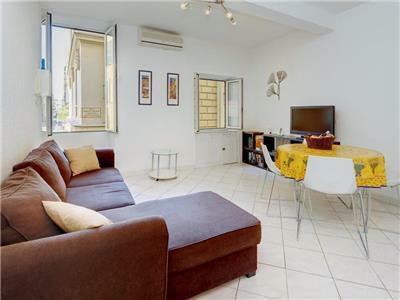 The apartment has been completely renovated with new and fresh furniture. 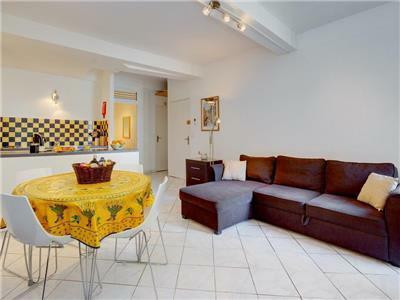 On entry you have a large livingroom with american kitchen. 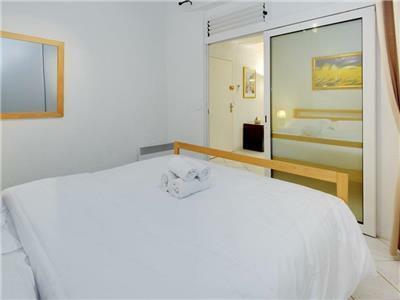 There is a double sofa bed, dining area with 4 chairs, large flat screen TV with Satellite channels inc BBC world, sky news - there is also free of charge internet access. 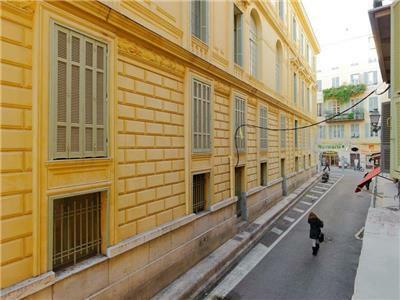 The apartment has 2 large (double glazed) windows which open to give plenty of air and light into apartment and allows you to experience the ambiance of the old town and allows the afternoon sun to come into the apartment. 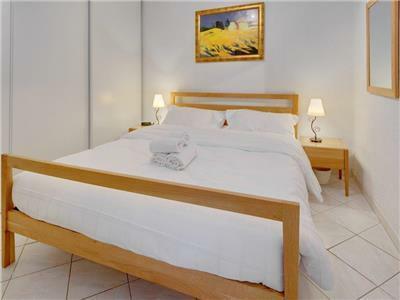 The bedroom has a kingsize bed, storage cupboards and bedside tables. There is new shower-room with good quality shower. The american kitchen has washing machine, cooking hob and microwave and full utensils. There is a full air-conditioning unit in the living-room which benefits the bedroom also at night. 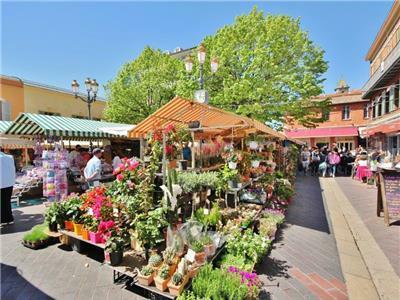 The location is perfect to sample the market and all the action of the old town - whilst the bedroom is at back of apartment so very quiet. 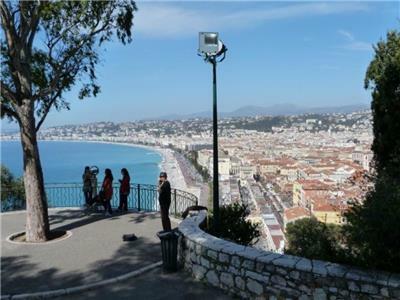 This is an ideal base for couple, family or small group to experience the joys and ambiance of old Nice. Cours Saleya	 Tourist Attraction 75 m.
Old Town	 Tourist Attraction 196 m.
Castle Hill	 Tourist Attraction 426 m.
Place Massena	 Tourist Attraction 448 m.
Place Garibaldi	 Tourist Attraction 641 m.
Nice Port	 Tourist Attraction 668 m.
Negresco Hotel	 Hotel Motel 1403 m.
Nice central train station	 Train Station 1450 m.
Promenade des Anglais	 Tourist Attraction 2.83 km. 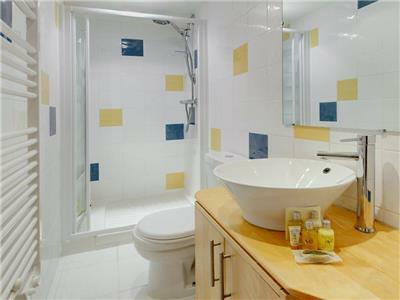 Very nice and clean and modern apartment with all amenities you need. there was also a babycot in closet. hallway to room is very narrow. with babytrolley this was quite challenging. beach was close but it was pebble-beach and very difficult to get to the sea. 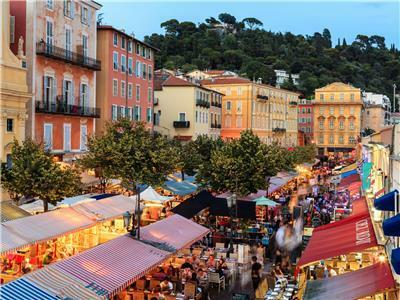 old town-marketplace is round the corner and easy access to place massena and harbour to go to monaco, cannes and antibes by bus. full recommend to this apartment.we will use again!! First of all the management company is excellent and has sent information about how to pick up the keys at the airport (with photos), and how to get to the apartment (with photos of the streets, building, and doors). Pick up of keys was easy - I followed the directions at went to the service desk at the airport and showed my passport. I got an envelope with a set of keys and directions. 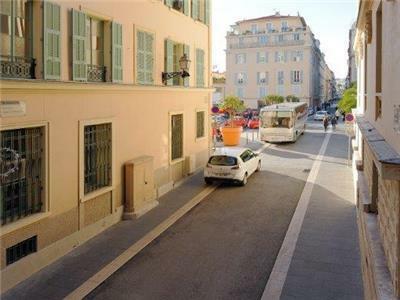 You will need to walk from the main road into Old Nice because cars can't normally get in there - though it looked like there was a way from cars to come to the front of this apartment (our taxi driver didn't know how). But it was an easy find once we started walking around Cours Saleya. There is only one flight of stairs to climb. The hallway to the apartment is very narrow, so only one person can pass at a time - if you have bulky luggage, it will be difficult.The apartment is just as pictured. The only negative is that it was hot during the time we were there, and the AC did not help much. If we kept the windows open, we can hear a lot of noise from the streets. Otherwise, it was a great stay. Easy walk to the beach, going to the market for fresh produce, fish, vegetables, etc in the morning, and a short walk to the tram stop. We were a little apprehensive about the key pick-up procedure and the fact there would be no one to meet and greet us when we arrived at the apartment, but it all worked perfectly. In fact, the detailed instruction booklet, complete with photos, was much more informative than some of the "greeters" we have had, and covered every appliance and machine in the building, along with recommended restaurants and sights. 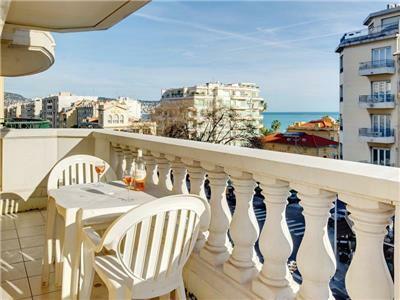 The apartment is as described, one street from the markets and two from the beach, and a very short walk to the excellent tram service. We walked to most places and ate locally at some of the miriad of cafes around, plus made use of the recommended pastisserie. 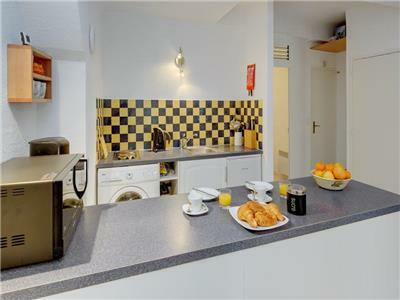 This apartment is just lovely, perfectly clean and with the best equipped and stocked kitchen of any we stayed in. My only slight criticism is the size of the bathroom (described as a "showerroom") but it was more than adequate and the shower itself was very good. 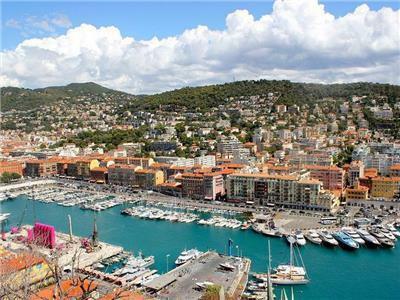 We judge our apartment stays by a few important criteria - introduction, kitchen, shower, bed, location, security, quietness and internet access, and on all these points Rue St Gaetan rated top of the class.Well done, GoNice. 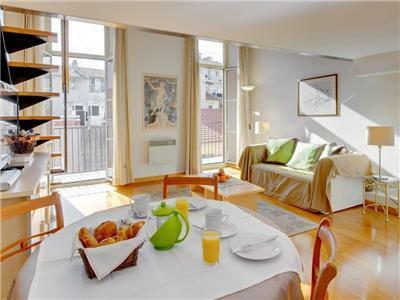 Wonderful situation,the online photos do not do the apartment full justice. The bed is very comfortable ,great strong flowing shower ,kitchen well equipped and couch and TV wonderful after along day exploring .We will be back ! 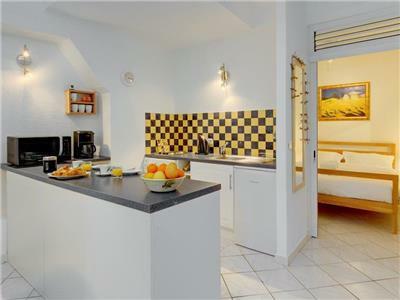 This apartment is located in Old Nice just 1 block away from the daily market of fresh fruit, vegetables, bread, cheese, meats, and flowers! 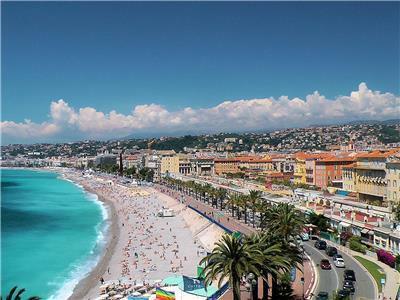 It's also very close to restaurants and the beach. We had amazing weather in mid-Sept. The apartment is very nice. Big bed, adequate kitchen, clean bathroom. The only minor compaint is that it's a bit tricky to get into (3 keys for different doors), and a tight squeeze to carry up a folded up stroller and baby. But it's only 1 flight of stairs so we managed. Everything worked fine and we were happy with Go Nice. A beautiful spot in a beautiful city! First, it took us too much time to find the office where we got the keys. 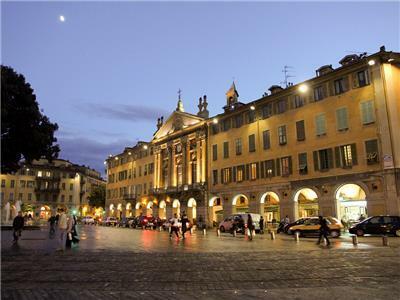 What's more, it turned out to be a problem to get there by taxi since the apartment is situated right in the heart of the Old town. However, the perfect location and the amenities made us forget any discomforts. The only drawback was the sofa which wouldn't convert into any decent bed. It could hardly sleep two, though stated it would. And what we particularly liked about the apartment was the view from the window. Not the sea naturally but lively and very niçoise. I have to say that Go Nice provides a very professional service from apartment description to key pick-up, etc. 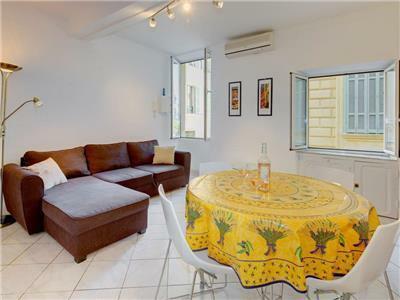 The apartment is ideally located and, as important, very quiet. 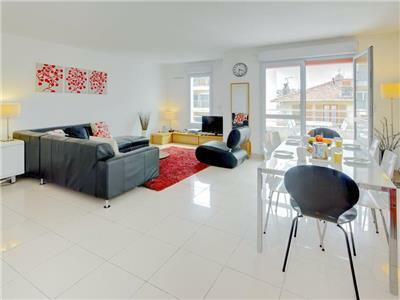 No hesitation in recommending the apartment except it may mean more people will want to use it! Location, cleanliness and comfort!! So much more impressive in person, the pictures don't do it justice. Fortunately, all was well. Having remarked about those 2 concerns I will say it is a fabulous unit and impeccably clean with lovely amenities, comfy bed, great water pressure in shower and furniture is like new! Again, the location is superb! Great find!! 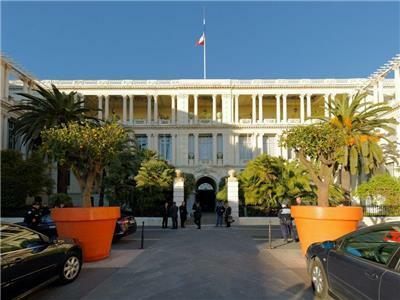 We have now returned home from our stay in Nice at 10 Rue St Gaetan. 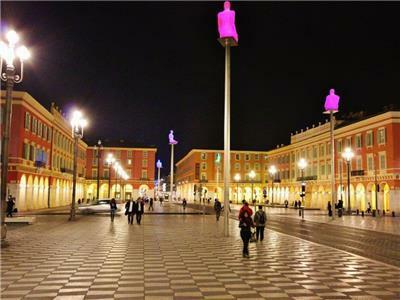 Already we are missing the fine city of Nice! Everything went well and we really enjoyed ourselves. The apartment was in the center of everything and we did not have to travel very far for entertainment whether it was during the day or at night. 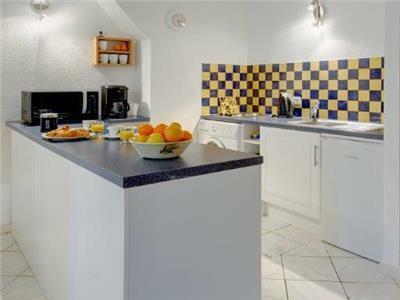 We have just returned from a delightful week at this ideally situated apartment. 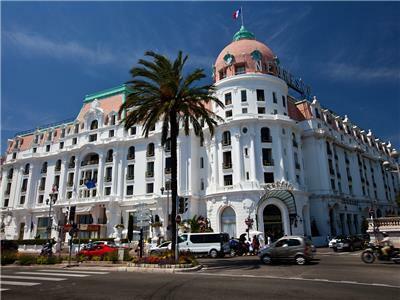 Nothing is further than a 10 minute stroll away,beaches,restaurants, shops and local transport. 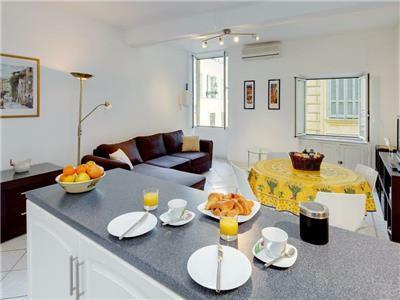 The apartment itself is very well equipped and furnished to a good standard. I am somewhat reluctant to give my honest opinion as I hope to return time and time again to No. 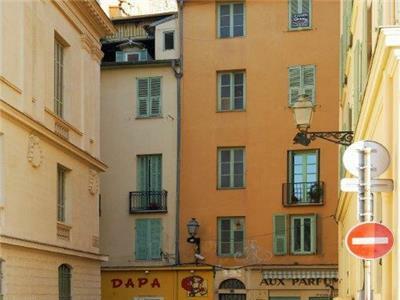 10 Rue St Gaetan, and selfishly dont want to add to any increase in bookings. We collected the keys at the airport with heart in mouth wondering would it be as advertised, as we booked it over the internet. We didnt need to worry, and was very impressed with Go-Nice as everything was where it was supposed to be. 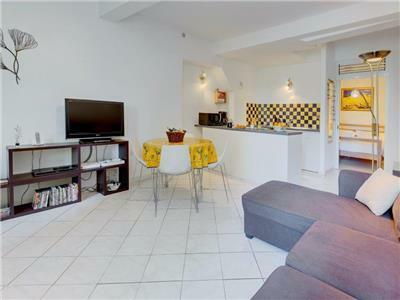 This small but very well equipped and laid out apartment, ensured that my family and I had every possible comfort for our week long holiday, late August. The weather was very warm, and not being used to it in good old Northern Ireland, we really appreciated the welcome cool air from the air conditioner, once we got back to the flat. No. 10 is located around the corner from everything, including the police station, but the area in general is very safe anyway. 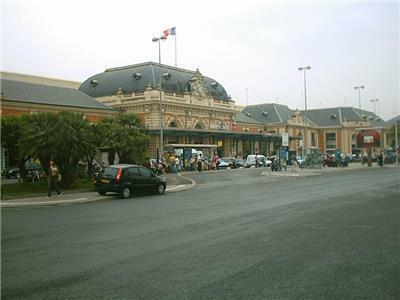 It was lovely to get up in the morning and turn left into the market for daily fresh breads, croissants, and cheese, and return again at night to see it had been changed into the craft fair. The beach was a five minute walk away, and the power shower ensured a daily swim in the sea was not a bother at all. The other residents were not to be seen, and quiet, and the bed was very comfortable. My 9 and 12 year old slept on the sofa bed and we slept like logs for the week. The TV wouldnt connect to the satellite and I believe this enhanced our holiday as we got to spend quality time exploring the picturesque old town, and adverturing into the City. Women head for Sephora in the new part, it is a whole different experience cosmetic store. At night the place comes alive with everyone dining out, and we particularly enjoyed a gorgeous meal at the Safari. There are great street entertainers, and watch the rappers and the roller bladers. Amazing. The supermarkets vary quite a bit in prices, try buy fresh produce in the market. A pint of larger can cost ?5. Stick to lovely local wine. A truly unforgettable holiday.